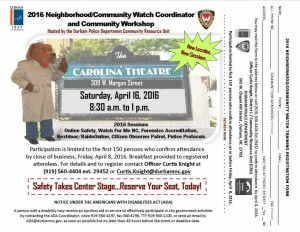 The Durham Police Department Community Resource Unit (CRU) is holding its annual Neighborhood and Community Watch Workshop on Saturday, April 16, 2016 from 8:30 a.m. to 1 p.m. at The Carolina Theatre, 309 W. Morgan Street. Session topics will include: Online Safety, Watch For Me NC (pedestrian/crosswalk safety), Forensics Accreditation, Nextdoor/RaidsOnline, Citizen Observer Patrol and Police Protocols. http://durhamnc.gov/formcenter/police-department-13/annual-neighborhoodcommunity-watch-work-126. [Otherwise, on the left side of the www.durhampolice.com home page, click “Community Resources,” scroll down to “Online Forms”, then click “Annual Neighborhood/Community Watch Workshop.” ] For more details and to register interested persons can contact Ofc. Curtis Knight at Curtis.Knight@durhamnc.gov at (919) 560-4404 extension 29452. NOTE: A person with a disability may receive an auxiliary aid or service to effectively participate in city government activities by contacting the ADA Coordinator, voice 919-560-4197, fax 560-4196, TTY 919-560-1200, or send an email to ADA@durhamnc.gov, as soon as possible but no later than 48 hours before the event and/or deadline date.